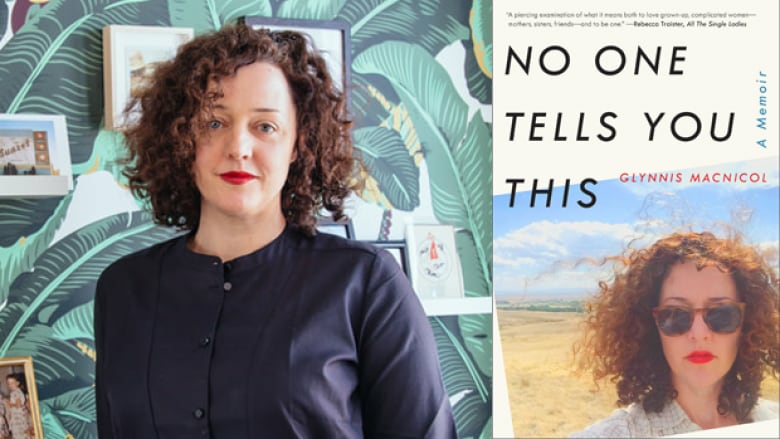 In her memoir, No One Tells You This, Canadian author Glynnis MacNicol reflects on turning 40 and the endless societal expectation that women be married and have children by that age. It's a refrain Glynnis MacNicol has heard many times as an adult, and one she continues to hear. As an unmarried, childless woman in her 40s she's often told that there's still time to find the right partner, still time to have children. The thing is, MacNicol is perfectly happy having neither. In her new memoir, No One Tells You This, she sets out to show that women can be happy outside the cultural expectations of marriage and children. MacNicol argues that there are few narratives that exist for successful, happy, unmarried women. "So I felt like ... I wasn't seeing my actual life reflected back at me in any way," MacNicol told Day 6 guest-host Gill Deacon. MacNicol begins her book on the eve of her 40th birthday. For her, 40 is a big deal and she finds herself at a bit of a crossroads. "I think 40 just exists for many of us as, you know, the age that's past the point of no return. And for women a lot of it is tied to fertility," MacNicol explained. Her friends wanted to throw her a big party, but MacNicol turned them down. Instead, she booked herself a hotel room on the waterfront in The Rockaways on Long Island, N.Y.
After an evening of angst and stress about failed relationships, a remarkable thing happened when she woke up in her hotel room on the morning of her 40th birthday: she woke up feeling satisfied and stress-free. Since there is no blueprint for the life of a single woman in her 40s, MacNicol set out to create her own and to prove that one can be happy and single at the same time. "I was increasingly sort of resentful that ... my life was as fulfilling and as difficult and as wonderful as anyone else's, but ... we don't have a language around that," explained MacNicol. "People are assuming I was … either an object of pity, or spoiled, or, you know, all that other language we use around single women." In her book, MacNicol recalls the story of being at a close friend's wedding when a relative of the bride came up to her table for a quick chat. The relative — whom MacNicol had just met for the first time — wrapped up the conversation by telling her that there was still time for her to get married too. MacNicol, a bit stunned, responded by saying that even if she didn't get married she'd still be OK.
"What I tend to encounter is the sense of, like, I'm not OK," said MacNicol. "It's, you know, 'Don't worry it will happen for you,' or 'You still have time,' or 'I still have faith you're going to find someone,' and that comes without knowing anything about my life." MacNicol notes that she's fighting centuries of cultural expectations in her effort to convince people that it's OK for women to never marry. "I don't think we have a language that's caught up to it yet," she said. "And trying to tell the story, you're up against centuries of storytelling that ends with women in marriage. And, of course, for centuries women couldn't really exist outside of marriage because they had no means to support themselves." Although she had no pressure from her parents to marry, MacNicol notes that religion, culture and family can make marriage — or the lack of it — more complicated. "I had one woman say her father threatened to write her and her sister out of the will if they weren't married by the time they were 40." Part of the problem, she says, is the lack of stories about women that don't end with a marriage or children. "I hoped by writing this book I would give other women the opportunity to sort of release themselves from whatever shame might be attached. I think we do tend to attach shame to women alone." "I think we look at women as if they're a problem in need of a solution and I just wanted to give one version of what a life for women might look like outside of those narratives." To hear the full interview with Glynnis MacNicol, download our podcast or click the 'Listen' button at the top of this page.